1. A yoga sling flip-flop for a sandal so comfy, you may never wanna go barefoot again. Get them from Amazon for $23.96+ (originally $38, available in 22 colors, and sizes 5–11). 2. A flat sandal to pair with literally anything and everything you own in your wardrobe because why to the darn heck not?! Get them from Amazon for $49.95 (originally $59.95, available in two colors, and sizes 5–11). 3. A strappy flip-flop that'll cushion your feet so you can prove the phrase "life is not a cakewalk," very very WRONG. 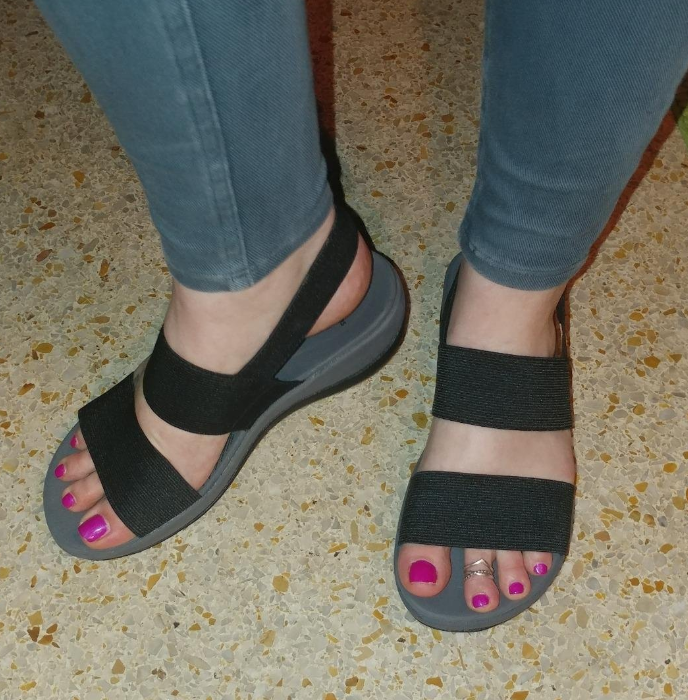 Promising review: "I absolutely love my Teva flip-flops. I liked this pair so much, I bought two more in different colors! 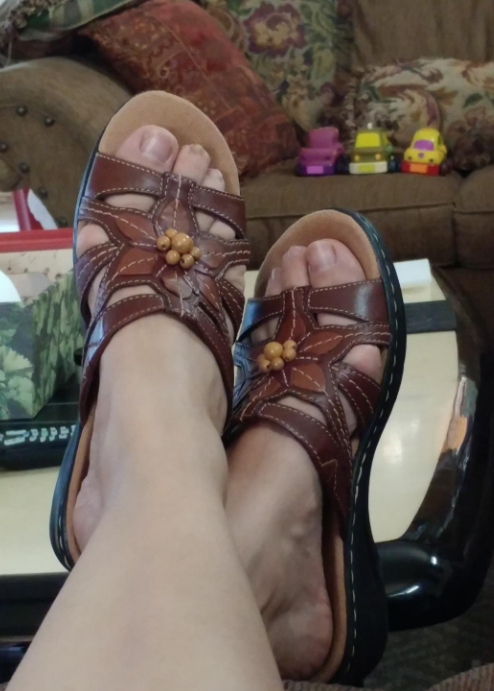 These sandals are very comfortable, and in my opinion, they run true to size. I've also been able to wear them for hours at a time without any discomfort. I decided to buy these after I saw a friend wearing them and she told me she found them on Amazon. The foam is sturdy and has lasted me all summer. I have no doubt that I'll still be wearing this pair next year! Very happy with this purchase." —Aly K.
Get them from Amazon for $19.96 (originally $25, available in 37 colors, and sizes 5–12). 4. An orthopedic wedge for those who wanna wear all the fabulous wedges with all their fabulous summer clothing, but know their feet have other plans. Promising review: "These are perfect summer staples. They're as comfortable as sneakers and versatile enough to wear with everything from jeans to dresses. The insole is padded and cushy. The cork is stylish. 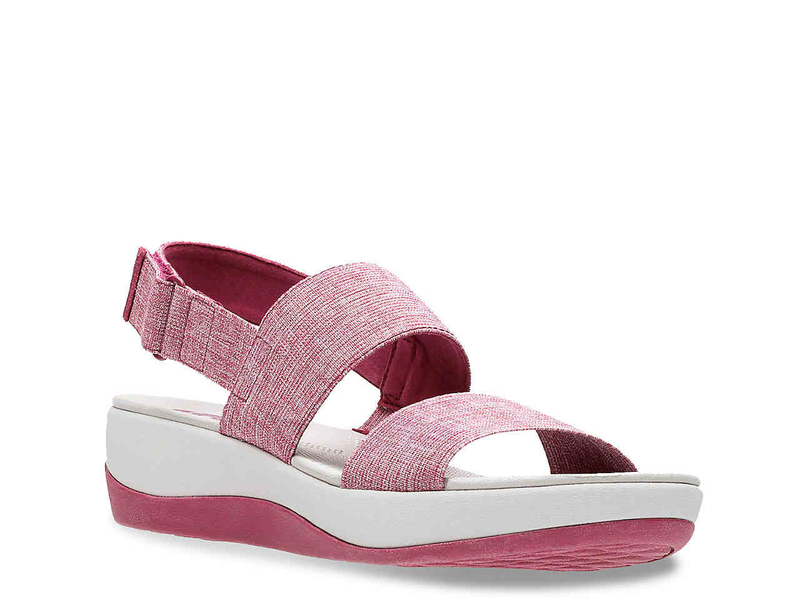 The velcro straps make these a breeze to get in and out of, and the platform gives stability and a boost in height, without the feeling of wearing heels. Love these!!" —Carol C.
Get them from Amazon for $76.95 (originally $95, available in six colors, and sizes 5–12). 5. A crochet slingback sandal featuring an adorable peep-toe to make your footsie wootsies look absolutely DAHHHHHLINGGGG! Get them from Urban Outfitters for $34 (originally $44, available in three colors, and sizes 6–10). 6. A studded gladiator that'll make you badass chicks look extra edgy. 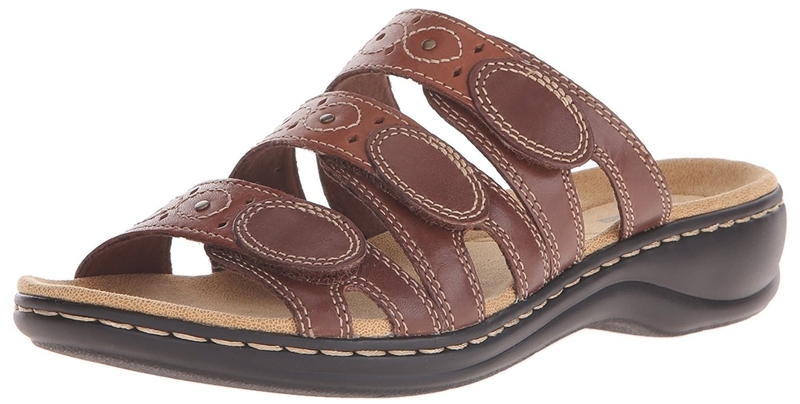 Get them from DSW for $29.98 (originally $39.99, available in sizes 5.5–10). 7. A pair of simple slides for quite literally sliding your shoes on and heading wherever it is you may be going while looking stylish. Get them from Amazon for $57 (originally $66.50, available in four colors, and sizes 5–11). 8. A comfy wedge slide with a floral decal that'll make an ideal daytime shoe, just know everyone is gonna stop and ask you how you're wearing something so nice without your feet killing you. Promising review: "Needed a sandal that provides good arch support and hides ugly bunions, but at the same time won't aggravate them. So far, so good in both areas! The fit is perfect and these are oh so comfy! A little more pricey than what I am used to paying for sandals but worth it to be comfortable and pain-free. Very cute. I'm happy." —M.A. Get them from Amazon for $68.95 (originally $85, available in five colors, and sizes 5–12). 9. A loafer-style sandal to buy if your favorite springtime trend was the classic loafer look. But hey, summer is right around the corner, why not step it up and get a sandal version?! Get them from Amazon for $75 (originally $79, available in three colors, and sizes 6–11). 10. A strappy suede wedge that'll be basic enough to pair with lots of different outfits, but stunning enough that you can bet on getting compliments every time. Get them from Zappos for $80.99 (originally $89.95, available in 10 colors, and sizes 6–11). 11. A thong sandal featuring a Michael Kors plate for those who take designer brands very seriously and wanna be sure those around them know exactly who they're repping on their feet. Get them from Nordstrom for $59.21 (originally $78.95, available in four colors, sizes 5.5–10). 12. A silver knotted gladiator to dress up your feet like the royalty we all know they are and deserve to be. They are YOUR feet, damnit. Get them from Missguided for $11 (originally $34, available in sizes 5–10). 13. A studded slide that'll show off just how trendy you really are. I mean, not that we had any doubts. We knew. Just so others are caught up and on the same page as us. Get them from Boohoo for $27 (originally $42, available in three colors, and sizes 5–10). 14. A clear heel for those who want a heel they can truly wear with anything. I mean, they're CLEAR, literally colorless, you can't get a more easy-to-match option than these. 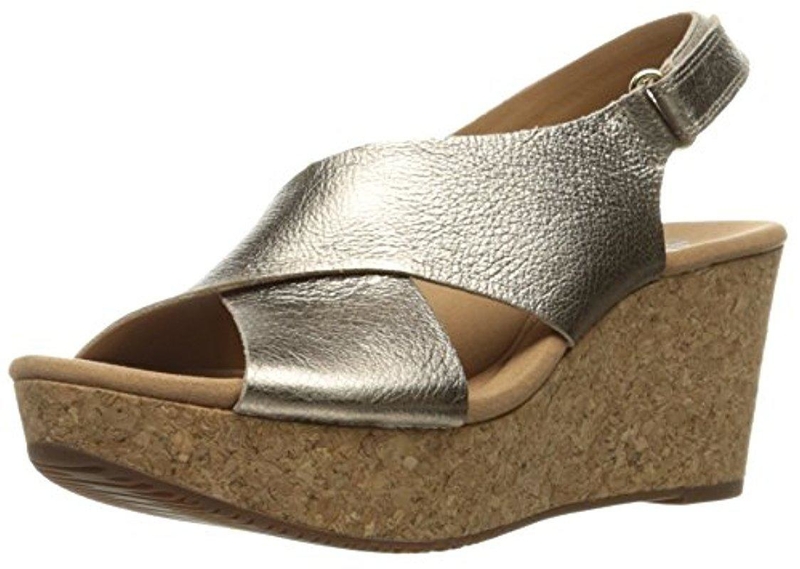 Get them from DSW for $54.99 (originally $85, available in sizes 6–11). 15. A faux-leather strappy sandal with a special slot just for your big toe to show off that it's better and more superior to your other toes. No offense to the others, they're all still great. 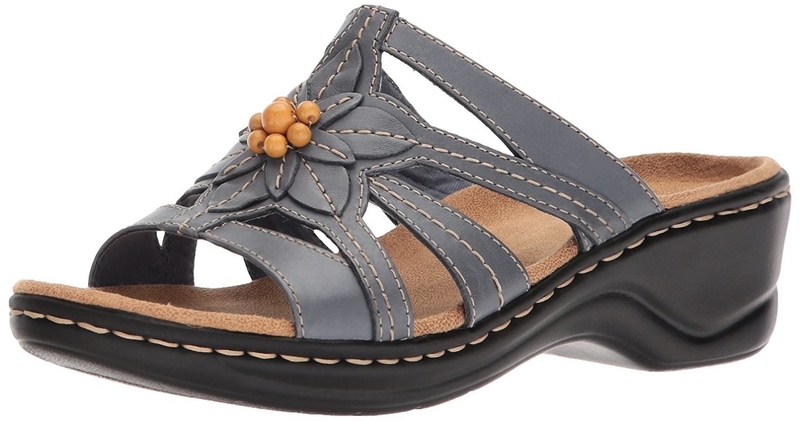 Get them from DSW for $39.98+ (originally $79, available in three colors, and sizes 5.5–11). 16. A pair of sandals literally called "cloudsteppers" for adding in your collection immediately. If you don't buy a pair of shoes with a name like this when they're on sale, then what are you doing?! Get them from Amazon for $36.79 (originally $65, available in seven colors, and sizes 5–12). 17. A pretty espadrille to make the other shoes in your closet jealous of how much use you're about to get out of these babies. Sorry to your other shoes, but mama has found a new favorite. Get them from Asos for $20 (originally $29, available in sizes 4–11). 18. A ruched leather slide that'll simply complement just about any and every summer look, as well as your wallet with an unbeatable price. Get them from Boohoo for $12 (originally $20, available in two colors, sizes 5–10). 19. A leopard print wedge for the nights when you're feeling like braving a heel, might as well turn things up a notch with a fierce leopard print. Get them from Topshop for $40 (originally $85, available in sizes 4.5–9.5). 20. A jelly sandal to allow your feet the ability to feel comfy, even after a full day of wearing these everywhere. Get them from Amazon for $29.14 (originally $34.99, available in six colors, and sizes 4–11). 21. A closed heel flat sandal that'll provide some much needed support when you start losing your cool over meeting your future celebrity spouse at their summer concert you have major plans of sneaking backstage at, and will carry you all the way through your honeymoon before you two spend the rest of eternity together. Get them from Asos for $38 (originally $57, available in sizes 5–10). 22. An orthopedic slide for a casual choice you can rest assured won't start hurting your feet one hour into wearing them. Get them from Amazon for $56.42 (originally $85, available in 10 colors, and sizes 5–12). 23. A detailed wedge that'll add the most beauty and grace to your feet, so if you were feeling too lazy to clean your chipped nail polish off your toes, don't worry, no one is gonna even notice now. Get them from Amazon for $41.97 (originally $54.99, available in three colors, and sizes 6–10). 24. A heel with satin wrap detailing for an absolutely stunning dress-up shoe. Get them from Nasty Gal for $24 (originally $60, available in sizes 5–10).